Khan memorial cricket tournament 2015 was held at Nehru Intermediate college ground from 17th Dec 2015 to 23 December 2015 followed by under 14 match on 24th Dec 2015. This tournament is organized in rural area of Tarya Sujan which falls under KhushiNagar district in Uttar Pradesh. The motive of getting this tournament organized is to remember my ancestors who have passed away and second biggest motive is to bring youth towards sports and stop them from going on wrong path. All the funding comes from within the family and My brother Sharib Khan is biggest contributor followed by my Aunty Shobha Khan and her son kamal haiyder. This year two celebrity Vikas Kumar and Parveer Aggarwal from Bollywood has joined this Mega event. Due to Vikas Kumar presence big names like actress Vidhya Balan, Indian test player VVS Laxman, R.P Singh, MD. Kaif and Suni Joshi has spoken few words for this tournament. TV star from CID Senior Inspector Abhijeet and Daya, also spoke about this tournament through video clip, and send their best wishes to the teams participating. The main tournament was won by team from Siwan and the under 14 cup was lifted by local team of Tariya Market defeating Paithani Tola’s team. In the main tournament following were the chief guest. 1. Honourable Dr. P. K Rai from Samajwadi party (S.P) a very famous face in Tarya Sujan. 3. Vikas Kumar Actor Director from Bollywood and a very famous face from serial CID. The Player of the match in the final was Pawan from Siwan, The player of the tournament was Puneet from Sallepur, Best batsman was Pawan, Best Bowler was Imran. First time we have used zing bells which used to light up as it used to fall on the ground. Player of the tournament was gifted a Bicycle. 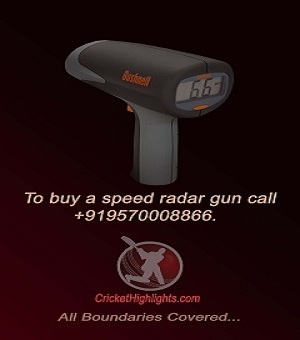 We also used speed gun to measure bowling speed of the bowlers. For the very first time in entire district camera was installed to show live match on projector and third umpire could make the decision after seeing the replay on the projector screen. Winner team walked away with trophy and cash money of Rs 7000 and rummer up team got trophy and RS 3500 as cash award. There was trophy and cash award for man of the match for every match and Best Batsman got a Bat and INR 1250 while Best Bowler got a packet of balls and INR 1250/-. The fastest bowler was Shahid from Bhulia team he clocked 131 KMP speed. He was awarded a trophy and INR 500. There was also award for predicting winner team in the final for the crowd. The under 14 winner trophy was lifted by Tarya Sujan market team and runner up was Paithani Tola. Winner got a trophy and INR 1000 while runner up got trophy and INR 500. All the matches was played for 6 overs. There was man of the match award for every match. Other awards were Player of the tournament, Best Batsman, Best Bowler and Fastest Bowler. Nadeem Khan clocked 111 Kmp and was awarded fastest bowler in under 14 category. My dream is to make this tournament more attractive and make more team play in it. We are working on this. Khan memorial cricket tournament will be played in different ground from 23rd Dec to 29th Dec 2016 and milaad will take place on 30th dec 2016. Your efforts to organize such a tournament in a rural set is commendable. The passion with which you involve yourself in organizing this event will go a long way in making this tournament a major annual event in Tarian Suajn. Wishing u the very best for the event in 2016. Thanks alot and I need all your blessing to bring this tournament a great sucess.